A recent post on the "Where Am I" thread got me wondering. Did this railroad ever haul any tourists? I cannot find much info on it. Equipment looks to be deteriorating badly and the track is in no better shape. Was this some guys dream that never came to be? What was the Sweetline Railroad? 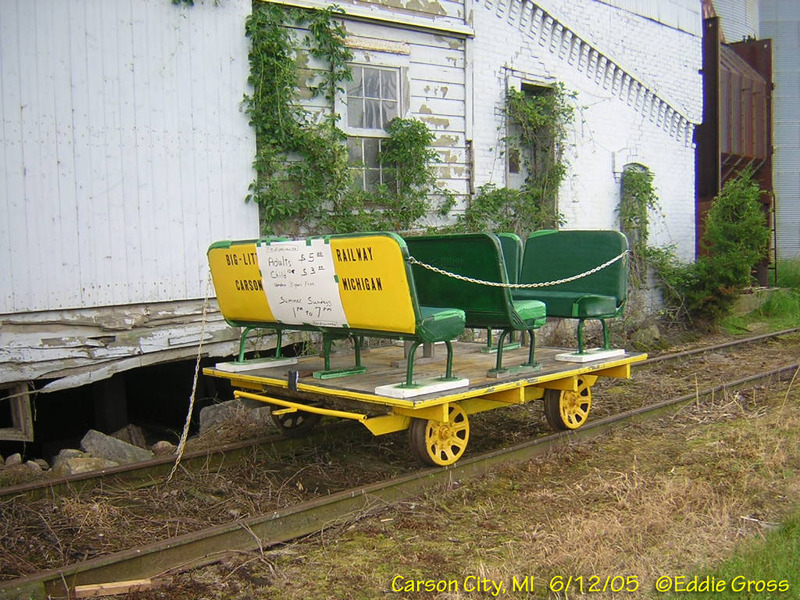 I don't think they carried tourists but some motor cars have traveled between Carson City and Middleton. I think it was named after an employee at Kellogg's Elevator (who bought the line around 1984 IIRC). Think it shut down around 1987ish(?). Not enough traffic to keep it open. Kellogg's was the only customer that I can recall. The other rail customer, Klein Fertilizer, moved to Perrinton around 1984 to retain rail service. I think Sweetline RR briefly leased/borrowed/used? one of the ex-MIGN GP's after they shut down. I've seen pics of a fireless cooker on the property, from one of the Wyandotte area railroads, as well as a GE of some model or the other. Here is a link to some pictures. Unfortunately, the included links are quite useless. Is the speeder group on this line still in existence? From this photo (below) it looked like they hauled tourists in 2005. I haven't heard of anything being advertised for a long, long time. The track doesn't look like it's been maintained to the slightest in years. Judging from the last time I saw it, I wouldn't ride a motorcar down that if you paid me. Too much debris on the tracks and there's just not much left. Hopefully someone with some inside knowledge can provide input. It'd be better than our sputtering and assumptions. For those interested, they'll be Speeder runs on the Sweetline this Friday, Saturday, and Sunday. I'll be there with my 1949 Fairmont M-19.